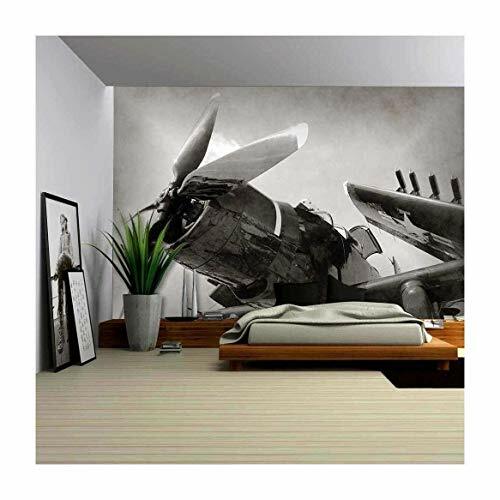 wall26 - World War II Era Navy Fighter Plane - Canvas Art Wall Decor - 66"x96"
Tough to align and install but beautiful and worth the work. I really really liked this, but the room was too small and the effect was lost. I wish I had an area that was a bit longer. sooo sad. Love it. True to their word, the mural was simple, but NOT easy to install. I see from previous reviews, that I also have the "crooked" walls which caused me to also have to over-lap the panels, AND they were uneven (slightly) at the top and bottom of the panels. I still love the overall "look" of the panels even though they did not line up perfectly...animals are not perfect in the wild or anywhere for that matter; so as I stated to my millennial daughter, I like the IMPERFECT look. I was initially prepared to be disappointed with the adhesive on these panels because of past wall decals (from other sellers); and I had glue sticks AND adhesive spray on hand just in case. I never needed additional glue at all. These panels were like fly paper they were so sticky. FYI do not have a fan on at time of install or window with breeze. I was able to install 8 (eight) panels (2 orders of 4) of the 66X size by myself in about 3.5 hours. I used the same "vision" of the decals as depicted here in the picture for a focal point behind my new bed. My panels do not reach the floor but my furniture should off-set that issue. I love these panels. Period. Plus they came waayyy ahead of schedule; so not only am I happy, but I am very impressed. looks really real. Hard to align by myself.